Wakasa (no) Kami Ujifusa (若狭守氏房) is said to have been the son of Seki Kanefusa (関兼房). He was born in Mino and later moved to Mikawa in Owari to serve Imagawa Ujizane (今川氏眞). His primary working period was the Tensho era (1573-1592) through the Keicho Era (1596-1615). The prevalent thought today is that he started out his sword-making career using the name of his teacher, Kanefusa (兼房), and after moving to Owari, changed his name to Wakasa no Kami Ujifusa (若狭守氏房). He probably was granted the use of the character “Uji” (氏) from Ujisane (氏眞). (若狭守氏房) being the direct son and student of Seki Kanefusa (関兼房). The other says that there were two generations of smiths by this name with the first one being in the Bunki era (1501-1504) and the second generation being the one we are discussing today. 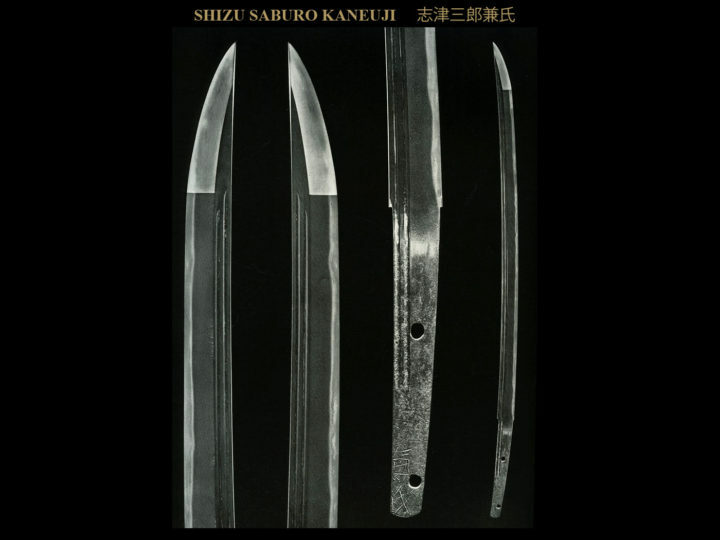 Since there are no definitive works left by the first generation, the general school of thought is that there was only one generation and he was the smith who made blades in the Tensho Era (1570’s). His lineage continued into the Edo era and his descendants produced many fine swords. The following are the general characteristics of the Wakasa (no) Kami Ujifusa Kei (若狭守氏房系). SUGATA: His works have a wide body and an extended bôshi. The shape gives a Sôshû like feeling to the blade. It will look like a blade from the Nanbokuchô era that has been shortened, however there will be hiraniku and the kasane will be thick. The fukura will have a roundness to it. These characteristics are all contrary to the Sôshû works of the Nanbokuchô era. JITETSU: Most of his works are in ko-itame with some masame mixed in. Some will have ko-mokume. There will be masame in the shinogi ji. There will be ji-nie. Tobiyaki will occasionally be seen giving an almost hitatsura type of appearance. HAMON: His works are generally done in nie deki and consist of o-notare and gunome with midare mixed in. There will be profuse nie becoming mura nie in some places. The hamon will contain such irregular patterns as two gunome in succession with some forming karimata-gokoro (the appearance of a web-footed goose design). 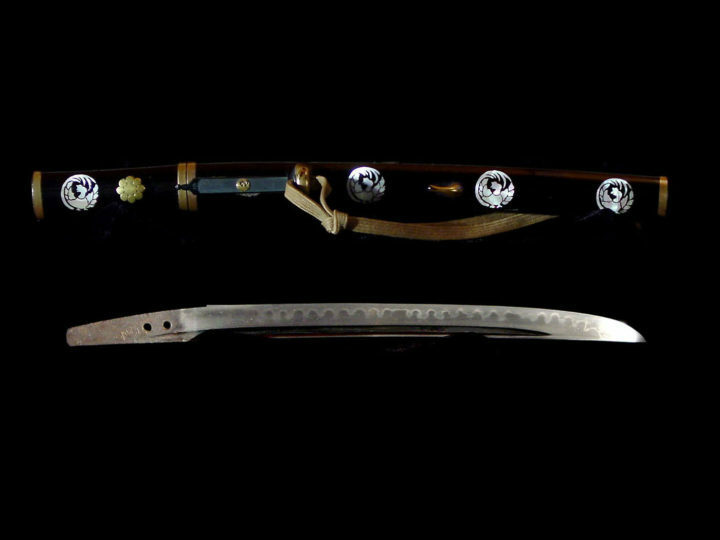 There are blades with a hamon of ko-chôji and ko-gunome in notare, with ko-ashi and yô. Sunagashi will be found. The hamon will be somewhat narrow at the hamachi and become wider as it works toward the kissaki. This is particularly true for Kanefusa (兼房). BÔSHI: The bôshi will be made in a midare-komi or in ichimai with a deep kaeri, particularly on his hira-zukuri wakizashi. 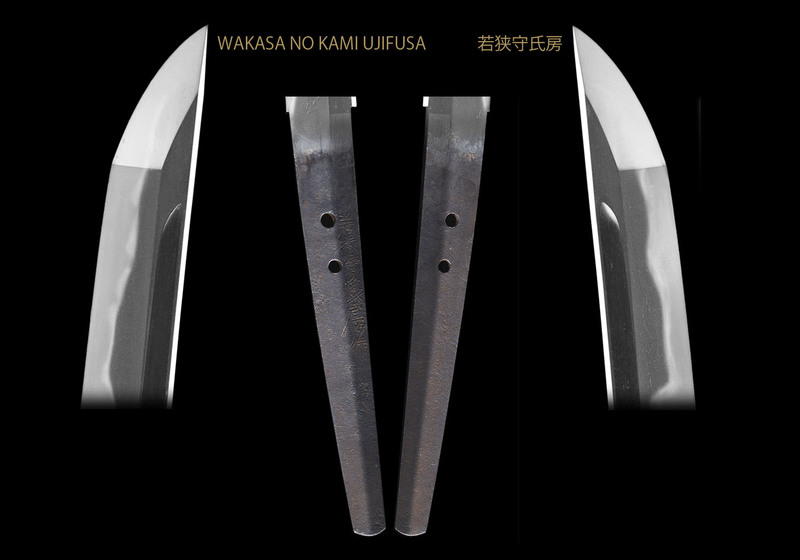 NAKAGO: Wakizashi nakago will be made short and stubby in the tangobara style. Katana nakago will be somewhat short and end in a kurijiri shape. The yasurimei is generally katte sagari. HORIMONO: Bôhi and futatsuhi are frequently found. MEI: Usually it is naga-mei, there is an occasional niji-mei. Of note is the fact that the characters, Ujifusa (氏房), will be carved larger than the balance of the mei. The example above has a hon-zukuri construction and an iori-mune. The curvature is shallow, and there is slight narrowing towards the point. There is saki-zori, and the kissaki is long on this stoutly shaped blade (the shape is excellent). This blade exhibits a typical Keicho shinto shape wherein the blade resembles a shortened (o-suriage) blade from the Nanbokuchô era. The kitae is ko-itame mixed with masame that is covered in ji-nie and tight. The masame in the shinogi-ji is powerful. 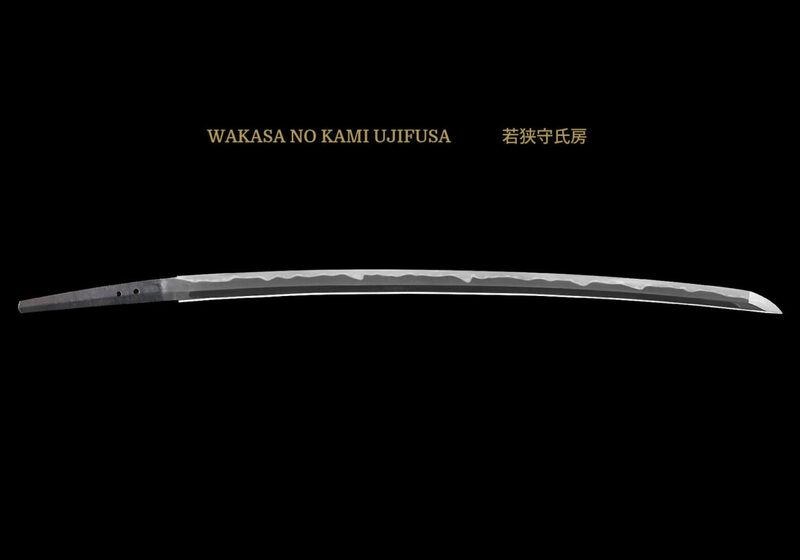 The hamon is nie-deki notare mixed with gunome and ko-gunome. The habuchi is well covered in nie, and the nioiguchi is tight, bright and vivid. The bôshi is shallow midare-komi, the point is covered in nie, and the bôshi is jizô in style. There are round-ended bôhi carved on both sides of the blade. The bôhi stop well short of the yokote, this being a characteristic of the Mino school from this time period and an important kantei point. The nakago is ubu, and the yasuri are shallow kattesagari. Dimensions: Length: 75.0 centimeters; Curvature: 1.6 centimeters; Width at the Base: 3.0 centimeters; Width at the Point: 2.25; Kissaki Length: 4.3 centimeters; Nakago Length: 19.8; Nakago Curvature: very slight. Features: The construction is shinogi-zukuri with an iori-mune. The blade is rather wide, and there is saki-zori with a somewhat broad point. The kitae is tight itame-hada with flowing grain here and there that is covered in ji-nie. 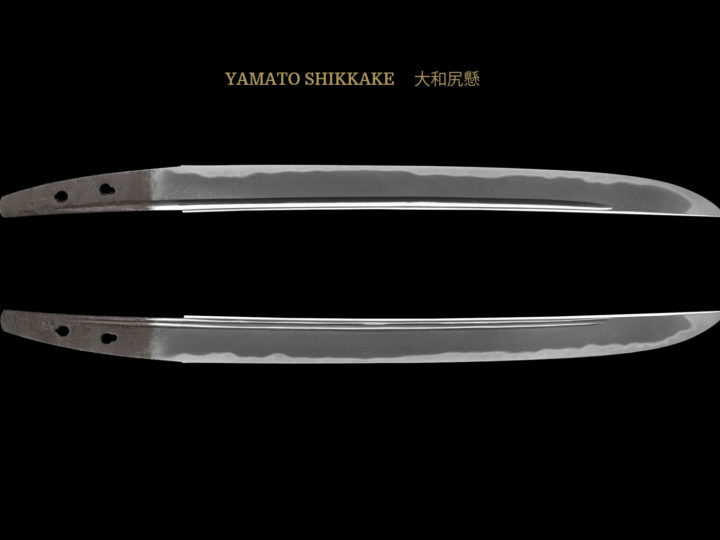 The hamon is ko-notare with a tempering in of gunome at intervals. There is ko-ashi activity here and there. The nioiguchi is slightly tight, and the habuchi is covered in ko-nie. There is a slight mixing in of tobiyaki. The bôshi is midare-komi, and the omote has a ko-maru, and the ura has a pointed feeling with a kaeri. There are round-ended bôhi carvings on both sides of the blade. The nakago is ubu, and the yasurime are sujikai. There are two mekugi-ana, and there is a long signature on the sashi-omote near the mune. Explanation: Wakasa no Kami Ujifusa is the son of Kanefusa [兼房], and he resided in Mino, Seki during the Genki and Tenshô eras (1570-1592). He is also said to have resided in Owari. 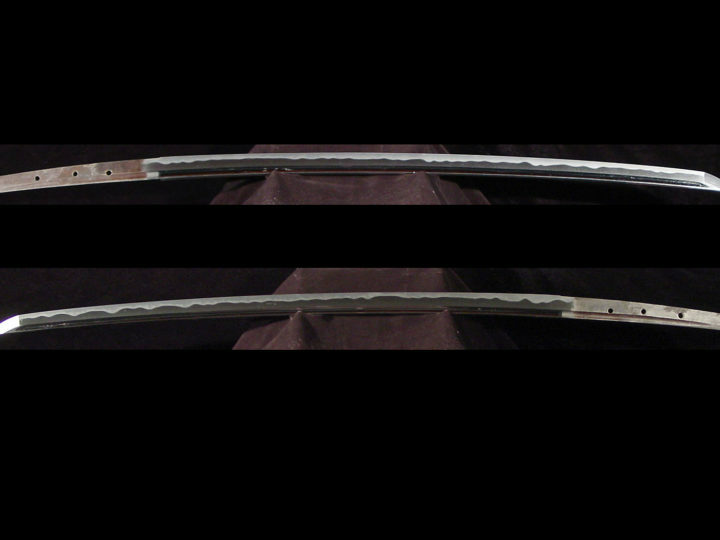 This katana has a jigane that is certainly excellent, and the style of workmanship is large-patterned. This is one blade that is a typical late Muromachi period Seki blade, and furthermore it is a representative work.